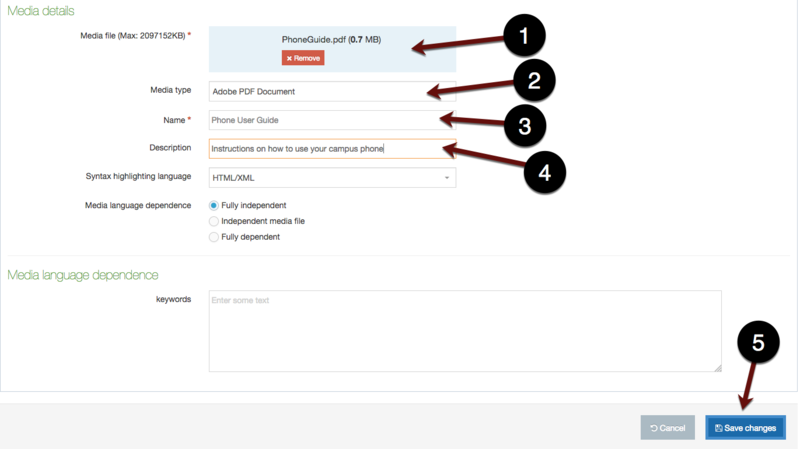 This guide contains information on how to use the media library in TerminalFour, the university's content management system (CMS). 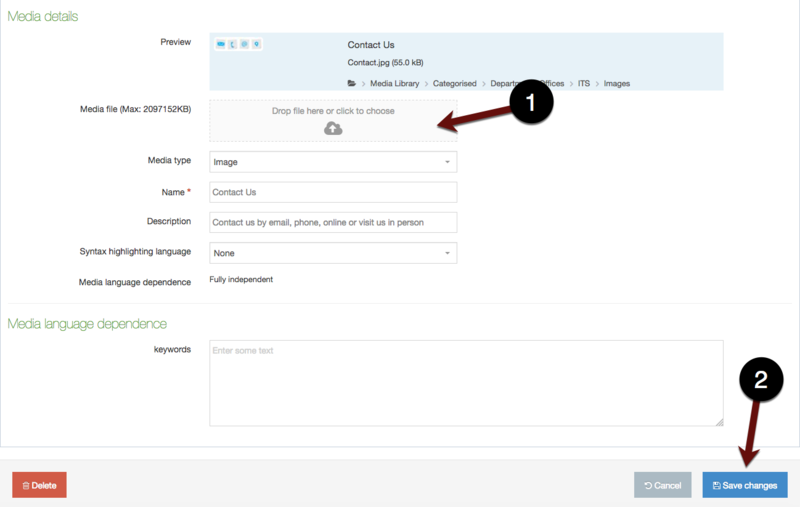 In order to use images and documents in your department's website, you need to load those elements into the media library. From the Media library, you can insert images or links to documents into your web pages. 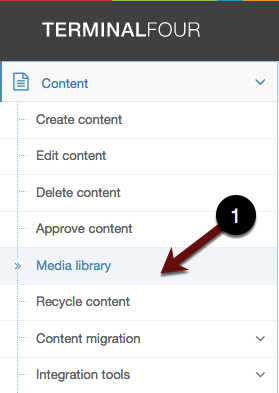 Accessing the media library is easiest from the Site Structure view under the Content menu. Once you have loaded your items in the media library, then you can insert them into your web page from either Direct Edit or Site Structure access. 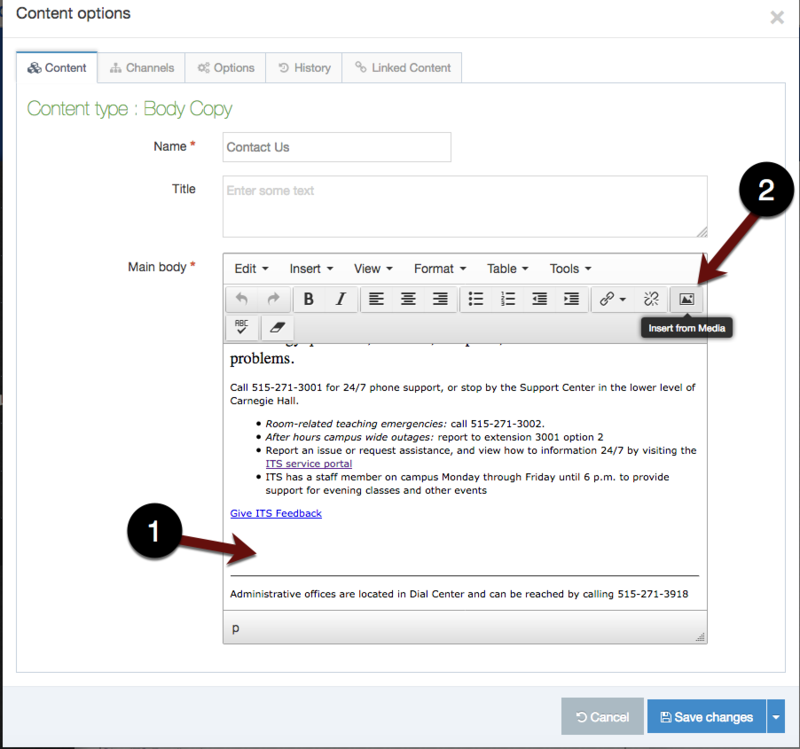 From Site Structure, click on the Content Menu in the upper left corner. Once you're in the Content menu, you'll see Media library as a menu option. There will be a listing of all media library folders. Click on the + to expand to find your department's media library folder. As you click open the folders, you'll see other folders nested within. Most department's media library folders are within the Departments Offices folder. Colleges Schools is the other most commonly used folder. 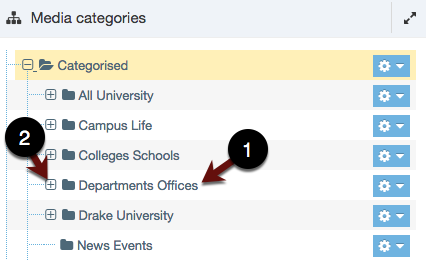 Click on the + to expand the category and find your department's media folders. Once you're on the media library folder for your area, click the green + Add media button. 1. After you click + Add media, you'll see the window below. Either drag your media item onto the designated area, or click to navigate to your file. For documents, unless you want people to be able to make changes to your document, always upload PDF files rather than Word or Excel files. This not only ensures that they can't be changed, but it also maintains all formatting. Once you've added a file, you'll see the file name and size in the Media file area. NOTE: If you're updating a document, you should always edit and replace rather than putting a new document in your Media library. This ensures that the current links to your media will stay intact. See Step 6 below. Media type should automatically populate according to your file type. Whatever you have as the Name for a document will be what shows up as a link to your document when you place it in your content. Description is what screen readers "read" to visually impaired visitors. This is only needed for images. Be sure to Save changes when you're done. Images are uploaded in the same way as documents. For images, you can upload .jpg, .gif or .png files. Names for images are for reference only unlike documents. Be sure to include a description for your image to ensure that screen readers can properly "read" your image. Although there are options for sizing images in the media library, it's best to size your documents before you add them whenever possible. Need a good tool for that? Try using Canva.com's free photo editor. Go to the Actions button next to the item you're trying to change and click on the arrow. Drag the new file to the Media file location, or click to navigate to the file. When you're editing your content, put the cursor where you want to insert your media item. Click the Insert from Media button at the right hand side of your editing toolbar. This will allow you to navigate to your media library to select your media item. Click on the Name of the image or document you want to insert into your page.